The Department of Defense announced today that some troops had quite the surprise on this first day of March. 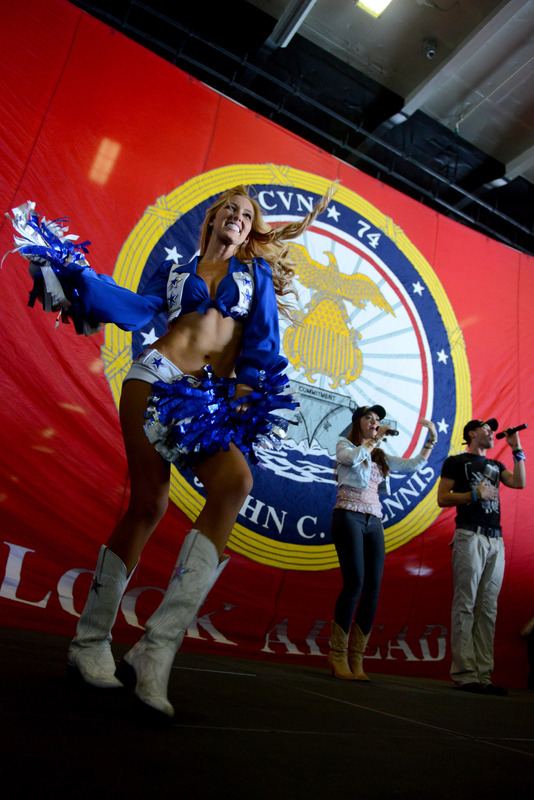 As a part of the Overseas with the United Services Organizations Tour, two Dallas Cowboys cheerleaders, Jackie Bob and Cassie Trammell, performed a dance routine alongside American Idol finalists Diana DeGarmo and Ace Young, who also performed for sailors aboard the Nimitz-class aircraft carrier John C. Stennis on Feb. 28, 2013. The host of the USO show was Navy Adm. James A. Winnefeld Jr.
Denver Broncos’ quarterback Peyton Manning headed to Bagram Air Field, Afghanistan, also for a USO tour. Manning thrilled onlookers by throwing a few passes into the audience. Austin Collie, a wide receiver with the Indianapolis Colts, and Vincent Jackson, a wide receiver with the Tampa Bay Buccaneers, assisted Manning on stage. In tow with Manning, as part of the tour, were a few sports celebrities to help entertain the troops. Retired Major League baseball pitcher Curt Schilling delighted the crowd with inspiring words, along with the National Football League’s Collie and Jackson. The cheerleaders and DeGarmo and Young also accompanied this event. The USO tours began in 1941 when Bob Hope and a cast of other entertainers sought a way to give back to the troops.